This is a departure from the norm - a toothbrush review! 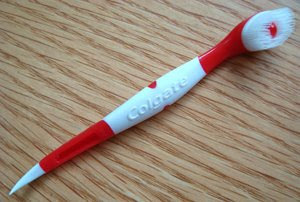 Colgate came out with a totally new concept, as far as I could discover... a tiny brush that has built-in paste. It's a great idea. You just pack it in your purse (ladies) or pocket (men) - and when you need more of a clean mouth than breath mints can provide, voila! It's only about 3.5" (90 mm) long. The "paste" is contained in that little red blob you see in the middle of the brush area. It gets released when you use it. Red is cinnamon and blue is peppermint. Flavor? fine. Clean mouth? yes. Idea: A+ Execution: C+. It fails in that it's just too short. I realized after using one that my mouth makes a seal around a brush's stem when I brush. The Wisp is too short to allow this. So I get saliva all over, unless I'm really careful. Finally, the packaging is excessive and wasteful. I'd vote for a longer stem that has interchangeable refill heads.